Wine before breakfast? You betcha! No one can resist the Fuente de Vino (the wine fountain) in Irache, not far from Estella where we spent last night. The fountain attracted a crowd of peregrinos who were waiting their turn in line to fortify themselves for the journey ahead. The little lever that pumps the wine only dispenses little dribbles at a time, so no one can take too much. Fair enough! Many peregrinos used their scallop shells for their wine. 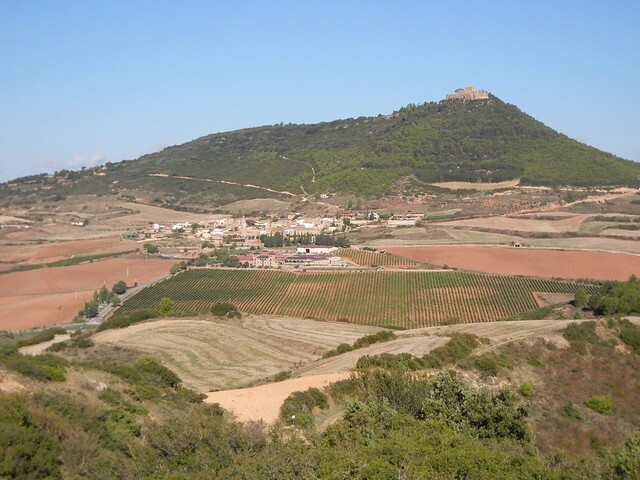 The vat is filled with 100 litres every day and opens at 8 a.m.
Not too far from the wine fountain, we had a choice of going two routes: the main, lower route that winds through the town of Villamayor de Monjardin or the upper, more rural Luquin route. 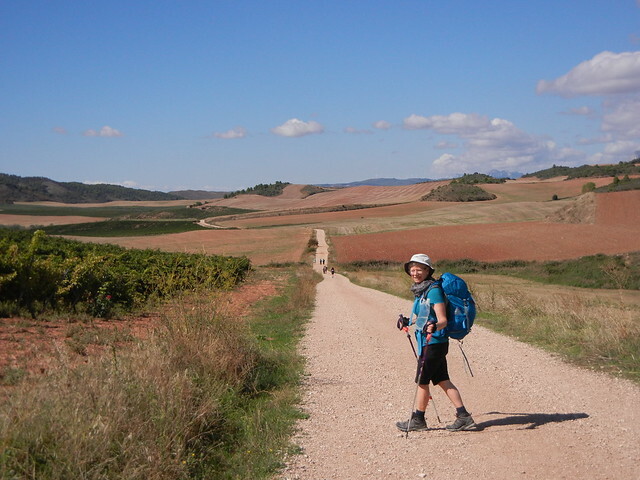 We chose to take the Luquin route in spite of the steep climb because of the promise of a fantastic view. 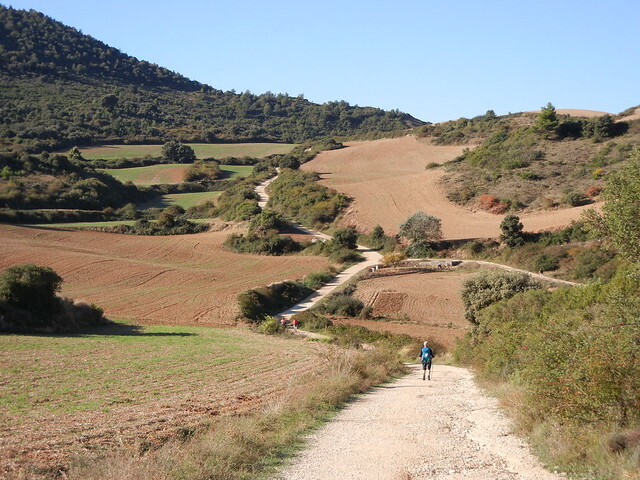 It is “the road less travelled,” so on this 8.7 km stretch we saw only three other peregrinos. The panorama and the fact that the route is entirely on natural pathways made us glad we went this way. 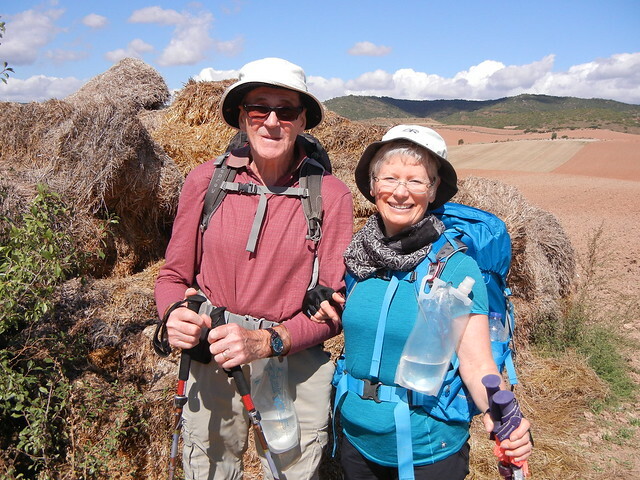 We were forewarned that facilities are limited, so we stopped at a grocery store on the way out of Estella for our standard meal on the trail of bread, cheese, yogurt, and apples. 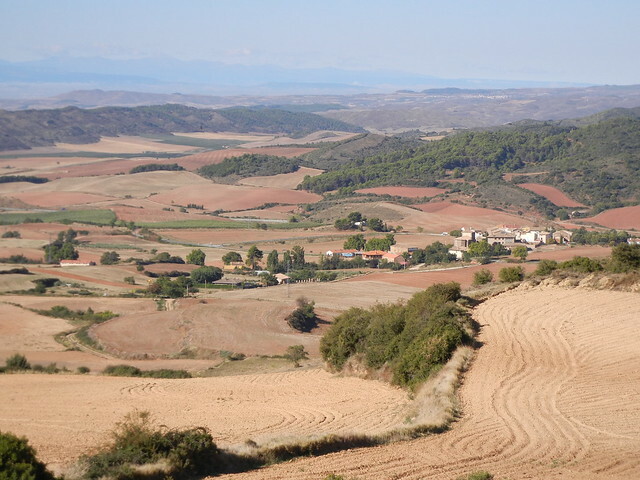 The first part of the walk was through delightful woodland to high fields and then finally the view opened up to reveal the town of Villamayor de Monjardin below and the conical peak of Monjardin with the ruins of St. Stephen’s Castle. 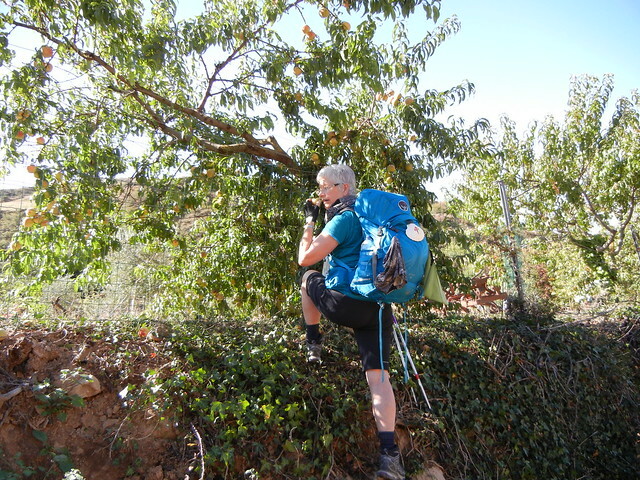 Eventually the route took us down through the typical hillside village of Luquin where we supplemented our meagre breakfast/lunch with less than ripe apricots, blackberries (smaller than ours), and almonds. I wasn’t sure what the peregrino up ahead was picking from a tree, but they turned out to be almonds. They have a soft, green outer part with the nut inside. Smash the nut with a rock and there is beautiful soft, white meat inside. They are better than the roasted/salted ones we buy in stores. These tasted more like marzipan. Our legs didn’t want to go any further! As beautiful as these gentle hills were, we were hoping to see Los Arcos over the next hill or around the next corner but (alas!) we were disappointed over and over again. 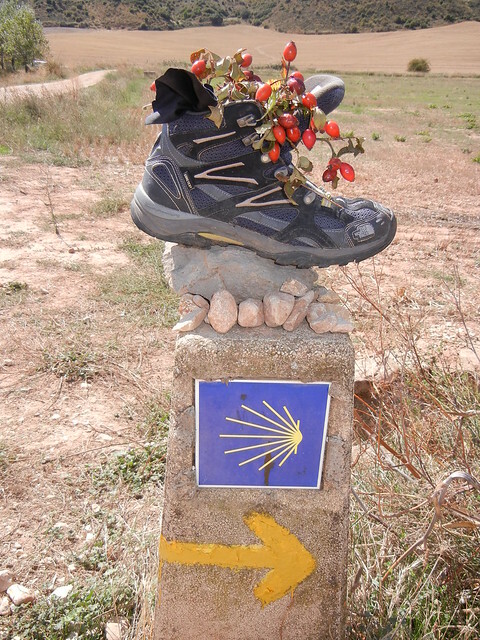 We swear that Spanish kilometers are longer than Canadian ones! I must have been panting with my mouth open at one point because a little white moth flew in and then out again with the next exhalation, no worse for the wear! Finally we arrived in Los Arcos and booked ourselves into a private room in Pension Mavi. Our room isn’t as good as the last two nights. There are no windows and, although we have a skylight, we can’t see the sky. But at least it is private and we have our own shower. Once again we have twin beds with sheets and towels. 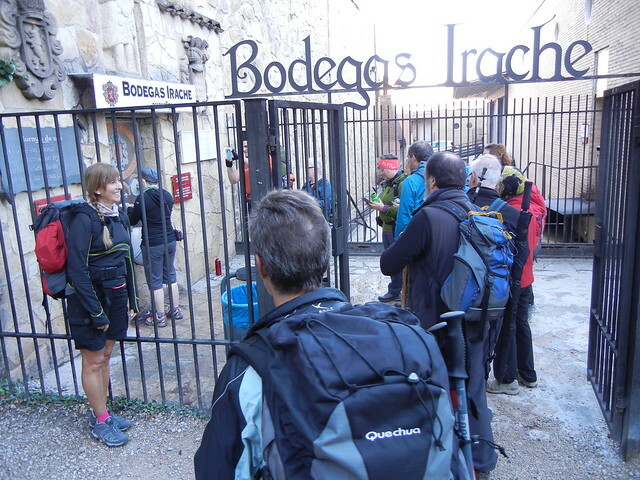 Is it cheating when we keep avoiding the complete peregrino experience of sleeping in albergues? Los Arcos is a classical pilgrim halt with Roman origins. It has narrow streets and a central church and square. 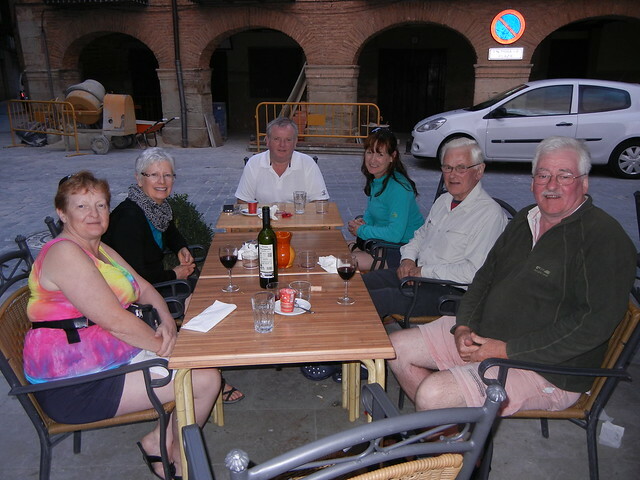 When we went to the square to look for a pilgrim’s meal, we once again saw our old friend Paddy from Ireland. We had dinner with him and his Irish entourage at a table in the square. Our dinner conversation was interrupted for quite a long time with the chiming of the church bells. They rang on and on, countless times. We looked at our watches and could tell by the ringing of the bells that it must be 7:30 p.m. Really?! After dinner is the time peregrinos get ready for bed so they can get an early start the next day, usually just before dawn. Early to bed and early to rise! Kudos for taking the road less travelled! The scenery is spectacular, and you are almost alone. How wonderful!